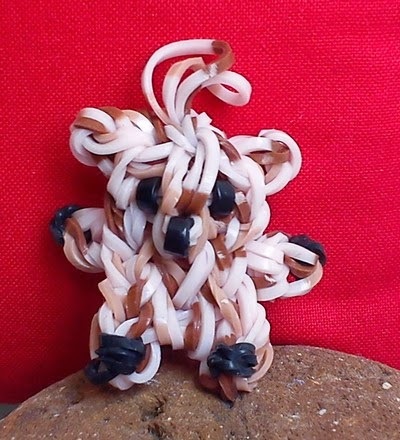 If you are a rainbow loom crafter, I'm sure you came across loads of Youtube tutorials to make little animals in rubber bands. After training with those, I decided to make my own kawai critter. On the right you can see the final cutie bear. Change the ears and you get a rabbit or whatever. I have to say the quality of the elastic bands play a big role on the final look. I'm planning on writting a tutorial, when I'm sure of the design. Below you can see the different attempts. 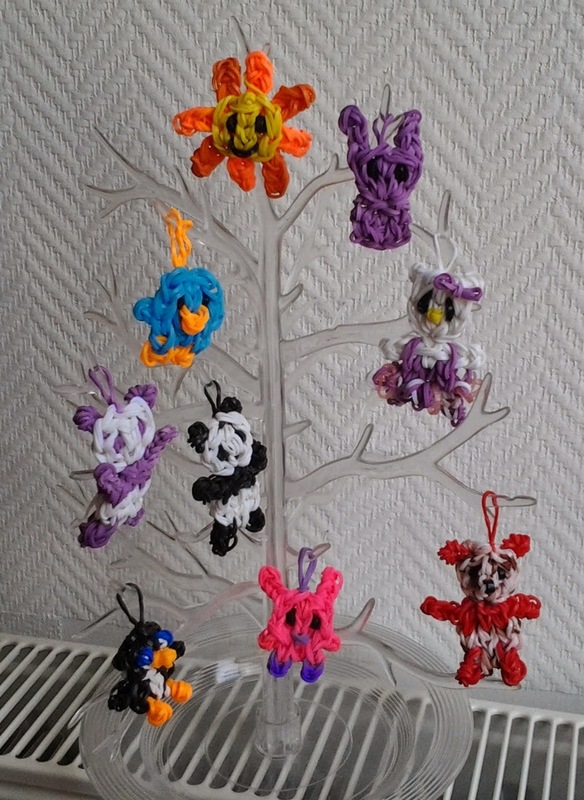 Si vous utilisez un rainbow loom, je suis sure que vous avez utilisé les différents tutos sur Youtube. Après avoir fait mon apprentissage, j'ai décidé de faire mon propre bonhomme super kawai. Mon préféré est cet ours blanc. En dessous vous pouvez voir les différentes variations. Notez que la qualité des élastiques est importante pour le rendu final. Je compte écrire un tuto prochainement. 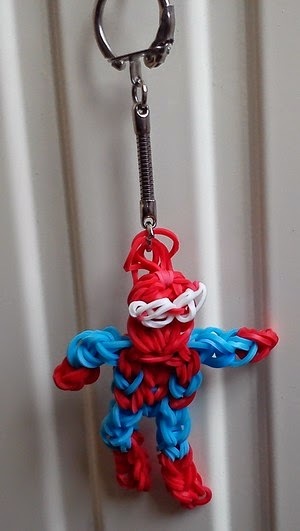 One of the first rubber characters I made with my rainbow loom is Spiderman for my man. This is why it has a keyring thingy already ! And you can make your own with the tutorial here. 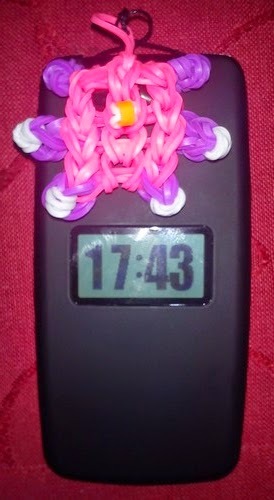 Un des premiers bonshommes faits avec mon rainbow loom est Spiderman pour mon homme, c'est pourquoi il a déjà un porte clef dessus ! Tutorial ici. phase 1 : Learn the technique. And if you get cute little characters in the process,it's even better. phase 2 : Create your own. Of course, it's the fun part, but also you can't stop wondering if others haven't come up with the same thing just five minutes before you. It's the joy and problem of the internet :great access to loads of ideas, but it feels everything has been done already. Anyway, I decided not to let it ruin my fun, especially when I make little creatures I will have to be a heart of stone not to let my grandma adopt some of them. If you follow my blog since some time, you might have noticed I love little cute things. So of course my animals are minimalistic. There are also technical constraints : I would need loads of white rubber and other neutral colours, when in shops you mostly get rainbow neon colours. As one animal requires more than 50 rubber bands...you can do the math yourself. Once again, I left this blog silent for a long while. Can't be crafty and showy all the time. 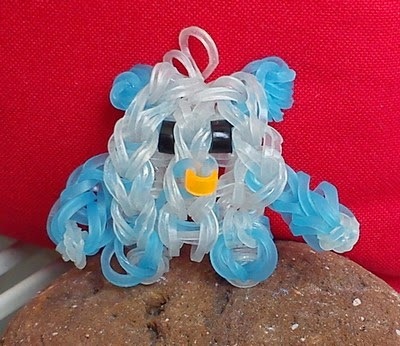 Unless you've been living into the wild for over a year, I'm sure you are aware of the rainbow loom phenomenon. Personally, I first saw them at the supermarket in May or June, and I have to admit I was tempted, very tempted. I love to try new crafts. But then it seemed to be making rubber bracelets,and so I thought it was a bit expensive just for that. How does it work ? Note that in France you mostly get the cheap versions of the loom, and the instructions were written so tiny in foreign language that I had to go to the web directly. Instructions are all YouTube videos. I love diagrams and written instructions. Videos take too much time, pausing and waiting for video lags.... And the bracelets I made, when I managed something that doesn't unravel on its own, were a bit disappointing. Too large or dodgy. I like the inverted fishtai design, but that's about it. Phase 3 : Go beyond the bracelets. This is where my good old friend Pinterest got handy. 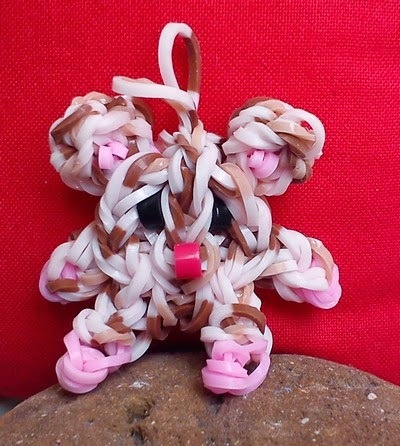 I wanted to see what could be done with rubber bands and loom. And I discovered the cute critters. It was hard to master, I spent a lot of time following YouTube instructions, but here they are ! 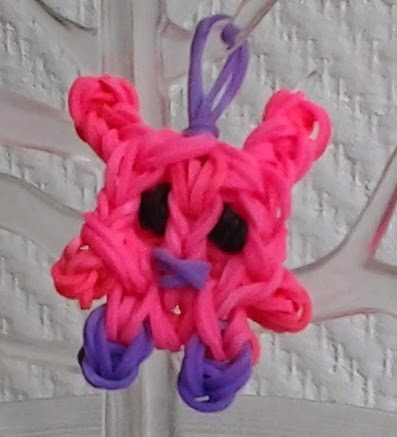 I have to make some more, and try and design my own, like the pink rabbit. Hours of concentration and fun coming my way ! 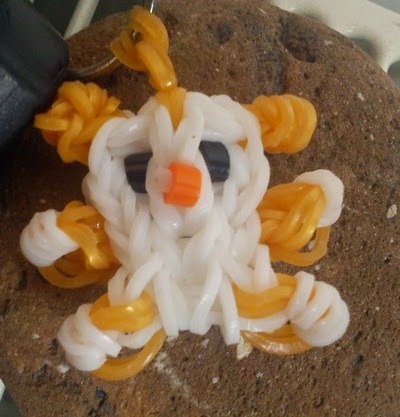 He oui, moi aussi je me suis mise au rainbow loom, après avoir résisté vaillamment 2 mois. Au début ce fut difficile, avec les instructions en microscopique et langues bizarres, mais les videos de youtube aident bien. Je ne suis pas fan des bracelets, du coup j'ai du vite chercher ce qui se faisait d'autre grâce à Pinterest. Et me voilà avec mes petits personnages, qui rappellent les amigurumis !